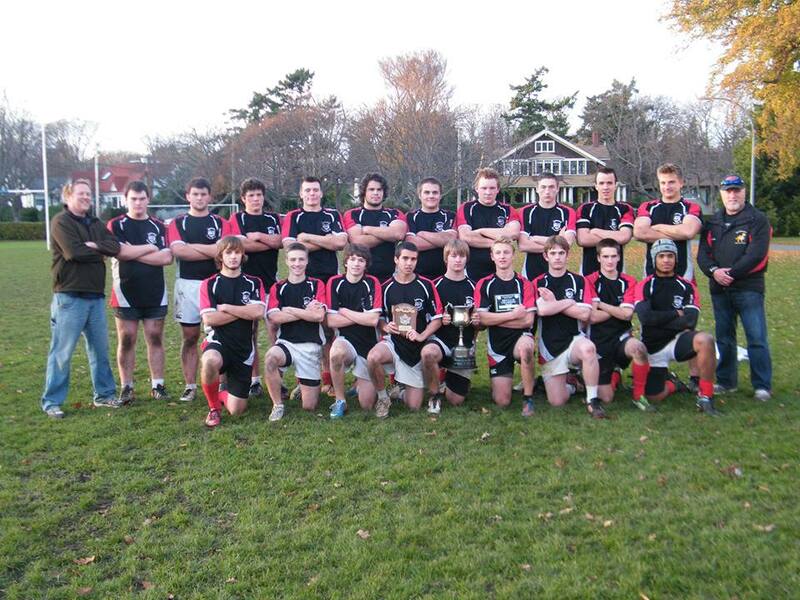 On Sunday the Kickers U18 Mens rugby team won the British Columbia Rugby Union U18 Provincial Championship played at Oak Bays’ Windsor Park Field. The game pitted the two best junior rugby teams on the Island – Oak Bay’s Castaway-Wanderers and the Comox Valley/Campbell River Kickers. The game did not start off the way that the visiting team had hoped as they gave up two tries in the first 10 minutes of play and found themselves behind 12-0. The Kickers fought back and narrowed the gap to 17-12 at the half time whistle. The Kickers’ game plan was to use their superior size and wear down the smaller, yet very skilled Castaways team. “Our plan was to eventually wear them down and then capitalize with our bigger players controlling the ball and game.” said head coach Darren Munro, who was assisted by Jim Ebert. “The lads did an excellent job of sticking to the game plan and executing what we as coaches had set out for them.” The plan was working as the score was tied at 24-apiece with about 10 minutes to go and the Campbell River/Comox players controlling the ball and moving down the field. Even the best laid plans can go awry, however, and the ball squirted out the side of a ruck and the Castaways were away and running. The players defended valiantly but the Castaways were able to score and take a 29 -24 lead. “It seemed that the supporters and coaches were more nervous than the players were, because when the boys came to center to kick they had a very determined look on their faces as if to say ‘nobody is going to stop us now’ ” added Munro. With less than 7 minutes to go the boys started their march down the field and after 4 solid minutes of controlling the ball Trevor Caton broke through the line and was running to the try line when he was run down by a Castaways player. Caton was able to offload the ball to Foster Dewitt who scored the try to tie the score at 29, with the convert to come. In rugby the convert is attempted straight out from where the ball is placed down in the try zone, or “in-goal area”. The convert was placed 10 meters in from the sideline and about 25 meters out, making this a very difficult kick. Caton stood over the kick and as soon as he struck it he knew it was good. “I had been having some difficulties kicking the past couple of weeks but as soon as it left my foot I knew it was good.” says Caton. This put the Kickers up 31-29 with three minutes to go. “That last three minutes was the longest of my life,” says Munro. When the final whistle went the local lads were very excited to be Provincial Champions. Strong games were played by all the boys but some standouts were Callum Passingham, who scored 2 tries, Foster Dewitt and Jackson Locker with 1 each. The other try was scored by Jimmy Brazier. The coaches would like to thank the parents, volunteers for their continued support of local junior rugby, but most importantly they thank the players for all their hard work and commitment.